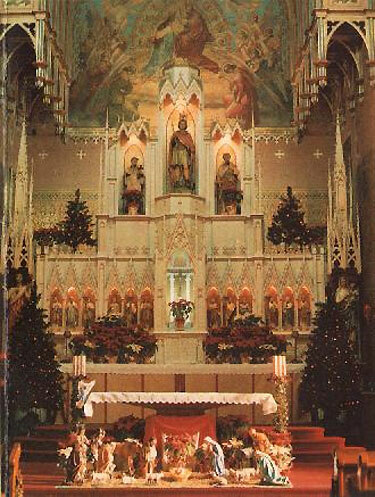 St. George Lithuanian Roman Catholic Church, Shenandoah, PA, decorated for Christmas in 1979. I served as an altar boy at Christmas mass here many decades ago. The Diocese of Allentown had this church, the grandest and most architecturally distinguished in its town, demolished in 2010. 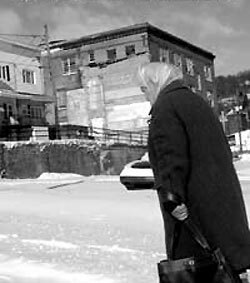 An elderly woman walks past the ruins of the former high school in Shenandoah, Pennsylvania. 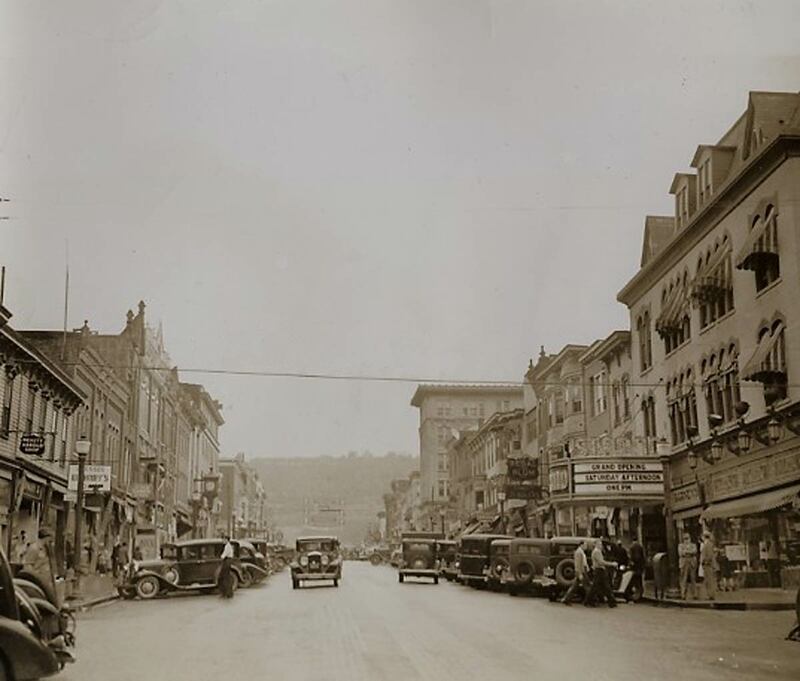 WNEP 16 reports that several once-thriving communities in Northeastern Pennsylvania’s Anthracite Region, including my own boyhood hometown, all one-time mining boom towns, are discovering that, after their economic raison d’être has disappeared, the population vanishes as well. [S]ome communities in our region are fast becoming virtual ghost towns. The proof comes from the 2010 U.S. Census which found in three area communities more than 25 percent of the homes and businesses sit vacant. The three communities are in the heart of the coal region. All experienced population and employment losses in recent years that left hundreds of vacant houses and storefronts. In Mahanoy City, Schuykill County, according to the U.S. Census, 26.3 percent of its homes sit vacant. Just a block from the main street a home is selling for less than a price of a used car. Shamokin, Northumberland County also has a vacancy rate of 26.3 percent. Afternoon traffic rarely stops on downtown blocks that increasingly see buildings for rent or for sale. Empty lots. Empty businesses that closed years ago. A drive through Shenandoah’s east side finds abandoned, unlivable homes. Others sit vacant for years, with little hope of finding a buyer. A rowhome for sale is covered with newspapers from the year 2000. “They’re not dead, but they’re certainly ill,” said Wilkes University economics professor Tony Liuzzo. He said the communities spiraling downward where jobs and people leave and vacant homes stay vacant. “There’s an increase in pressure on the individuals who are remaining there and, of course, you don’t want to be the last one left holding the bag, so to speak,” Liuzzo added. John Dopkin calls his east side Shenandoah block the loneliest place imaginable. “I have no friends, all my friends are gone. I just lost my wife a year ago, and I’m waiting to go myself,” Dopkin added. St. George Lithuanian Roman Catholic Church, Shenandoah, PA, decorated for Christmas in 1979. I served mass at Christmas there many decades ago. The Diocese of Allentown had this church, the grandest and most architecturally distinguished in town, torn down in 2010. Shenandoah, Pennsylvania: South Main Street in the 1940s, a bit before my time. My high school and elementary school classmate Norman Gregas posted on Facebook this Iris Dement nostalgic tribute to a vanished small town, particularly applicable in the case of our hometown whose treatment at the hands of time and economic change was exceptionally destructive and cruel. Butler, the historian of the Romish calendar, repudiates George of Cappadocia, and will have it that the famous saint was born of noble Christian parents, that he entered the army, and rose to a high grade in its ranks, until the persecution of his co-religionists by Diocletian compelled him to throw up his commission, and upbraid the emperor for his cruelty, by which bold conduct he lost his head and won his saintship. Whatever the real character of St. George might have been, he was held in great honour in England from a very early period. While in the calendars of the Greek and Latin churches he shared the twenty-third of April with other saints, a Saxon Martyrology declares the day dedicated to him alone; and after the Conquest his festival was celebrated after the approved fashion of Englishmen. Edward VI promulgated certain statutes severing the connection between the ‘noble order’ and the saint; but on his death, Mary at once abrogated them as ‘impertinent, and tending to novelty.’ The festival continued to be observed until 1567, when, the ceremonies being thought incompatible with the reformed religion, Elizabeth ordered its discontinuance. James I, however, kept the 23rd of April to some extent, and the revival of the feast in all its glories was only prevented by the Civil War. So late as 1614, it was the custom for fashionable gentlemen to wear blue coats on St. George’s day, probably in imitation of the blue mantle worn by the Knights of the Garter. England was not the only nation that fought under the banner of St. George, nor was the Order of the Garter the only chivalric institution in his honour. Sicily, Arragon, Valencia, Genoa, Malta, Barcelona, looked up to him as their guardian saint; and as to knightly orders bearing his name, a Venetian Order of St. George was created in 1200, a Spanish in 1317, an Austrian in 1470, a Genoese in 1472, and a Roman in 1492, to say nothing of the more modern ones of Bavaria (1729), Russia (1767), and Hanover (1839). St. George, being a soldier saint, was also a favorite of the Lithuanians, and the Lithuanian parish in Shenandoah, Pennsylvania where I grew up was named for him. Our church’s cornerstone was laid in 1891, and construction was completed in 1894. In 1901, the frame church was clad in brick and twin towers erected. In 1907, a poor immigrant coal mining community spent nearly $100,000 covering the church in granite and decorating its interior in the Gothic manner of Pugin. The diocese of Allentown in its wisdom demolished St. George Church during the winter of 2009-2010.
the Archives of Never Yet Melted in the 'Shenandoah Pennsylvania' Category.